Ant's VR6 - soon to return? Thread: Ant's VR6 - soon to return? 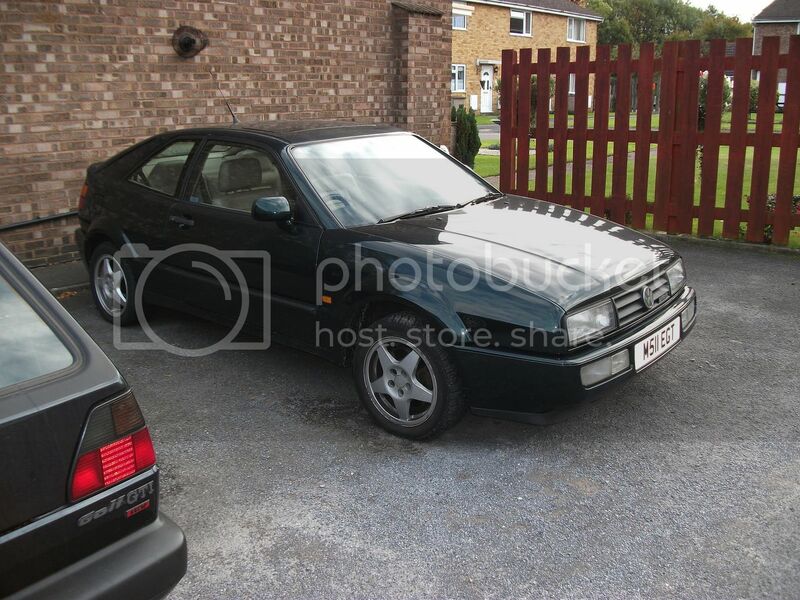 I had been lurking on the forum for about 12 months, umming and aahing about getting a Corrado. My first memory of wanting a Corrado was when I used to look through the new/used cars section in old top gear magazines and I loved the shape, and the fact it was a VW. My dad had a MK2 Golf GTI at the time, which must be responsible for my VW-lust in later life! My first VW (well actually it wasn't mine - it was my parents' second car for a while) was a 1989 Tornado Red MK2 Golf CL. It was a tidy car, not rapid, but it felt so smooth to drive compared to my previous cars. I drove it over the summer before going back to uni and loved it, and I was gutted when my dad sold it. 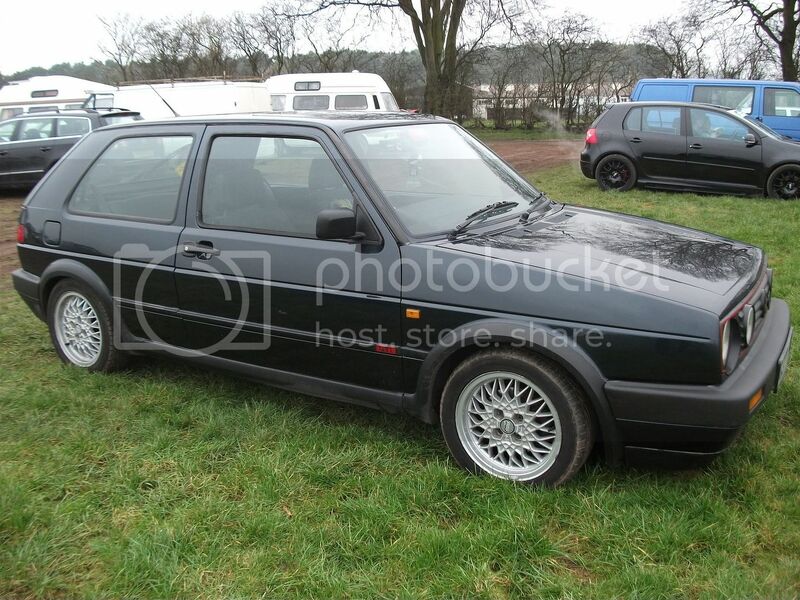 Fast forward to 2009 and I could finally afford to get another MK2 Golf - this time a GTI. I got a lovely 5-door 8v J-reg in Pearl Grey (underrated colour...), and spent a lot of time getting it standard and making it shine. Then last April some twonk pulled out of a blind junction in front of me leaving me nowhere to go, and in a flash the car was written off. I seriously contemplated getting a Corrado then, but I decided to get another MK2 instead, this time a Royal Blue 3 door 16v. It was a bit of a mess when I bought it but again I spent a lot of time fixing it up again, and it's looking a lot better now. I got the itch for a Corrado again in the summer, and scanned the classifieds. I made a few enquiries but didn't seem to get anywhere. There was a VR6 which had been for sale originally at £2500, but reduced to £1250 over a period of a couple of months. I took a look at it on the way back from London - it looked pretty good for the money. Apparently I was only the second person to have seen it - the first left a deposit and never came to collect the car! I was finally the owner of a Corrado! I've done a bit of digging into the history of the car. 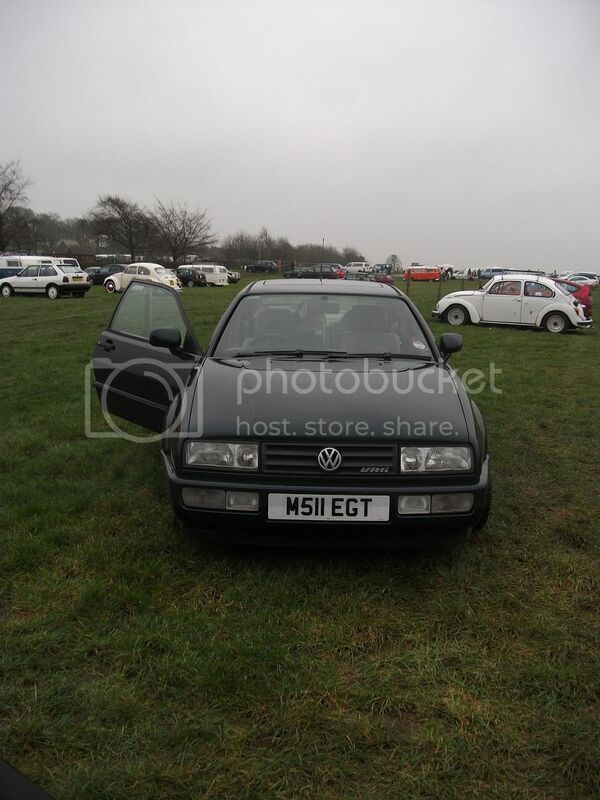 It seems to have spent a lot of time in the London area, and has a full VW service history until about 175000 miles. It has had 5 owners before me - the first appeared to be the VW dealership, so I suspect it was a demo car for the first 12 months. The next two owners serviced it meticulously at VW, and then it looks like it was sold to the 4th owner in 2008. They put on about 20000 miles in a year, but also got the chains and clutch chained in that time, before selling it to the 5th owner that I bought the car off. He stripped out the grey cloth interior and swapped it for beige heated leather and changed the heater matrix. Unfortunately someone also attempted to break into it under his ownership, so there was some damage around the tops of the doors. Even so, I landed myself with a Classic Green VR6 with a beige leather interior, with a super-smooth (even if high-mileage) engine. Last edited by tony_ack; 5th February 2019 at 10:47 AM. The car wasn't without a few problems of course. There were a few bits of beigie trim still to find. The headlining had been trimmed in Alacantra - it was an okay-ish job, but not perfect, and there were still a few ripples in it where it had been glued on. The sunroof didn't work (I was told it was the motor, but assumed the worst anyway), and the passenger window also didn't work. Externally there was a bit of damage where they had tried to break in, a deep scratch on the passenger door, and loads of marks/dents/scratches across the swage line. There was also quite a bit of rust on the tailgate and a little on the driver's front wing. One of the foglights was cracked and there was a push button start installed. A good list to get stuck into, but the rest of the car was good. The front end was gleaming - it looks like it has had a spray on the front end at some point as the paint is perfect with no stone chips at all (I've checked and no signs of accident damage, so not sure why it was sprayed..). The engine is amazing. So tight, smooth quiet and torquey - I really can't believe it has done over 200000 miles. It burns clean and doesn't use any fluids except a tiny bit of water around a pipe going into the aux water pump. It runs a little cool, and I've never seen the oil temp over 105 (usually 90-100 on a spirited drive). Got a replacement for fairly cheap, easy swap! Struggling to find this - I keep scouring the classifieds and even eBay but nothing yet. A few overpriced items, but £125 is too much for a gear surround. I got a black boot carpet to replace the grey one left over in the car. I made an attempt to get my sunroof working with a new motor. It tilted, and didn't slide... typical. I tried winding it back by hand, but then felt a 'snap' as the cable guide broke. I closed the sunroof the best I could and unplugged the switch so it couldn't be used. I managed to pick up a second hand classic green sunroof panel and mechanism for quite cheap (and free motor, and switch, and cover, and headlining - cheers Phat! ), but it seemed to stick a little when sliding back. I decided to dismantle the whole mech and clean it out. Wasn't too bad, but the 'fur' on the cables took a while to remove. I put it all back together, and sprayed in endless amounts of white grease. The cables were aligned, and the panel now slid back and forth freely. I then set to work cleaning the headlining using some Biobrisk and a damp cloth, and it came up a treat! The big day finally came to fit it all - dismantling the old sunroof and removing the headlining is easy if you work methodically, and it was out in about 30 minutes. Then it was a case of installing all the new stuff. Before the headlining went in, there was the moment of truth... Testing... and it worked perfectly with the motor! Took me another 15 minutes or so to align the panel properly and a little while more to get the new headlining in. Looks much better now! Got a replacement one of these too - the old one is rusting around the window seal, and under the spoiler. Not fitted yet - theres a bit of rust inside the tailgate that needs treating first. It went in for a service and I was told the rear brakes were shot, as were the wheel bearings, and the handbrake was lousy too. I got all VW parts, as the discs weren't too pricey. Took me a day to do, but not too bad in the end once I had pressed (hammered) in the new bearing races. Also did the bump stops at the same time. One of the handbrake cables had got stuck in the guide sleeve, so that took a lot of huffing, puffing and swearing to get out. My first plan is to lower it. I don't want to comprimise the smooth ride, but it sits far too high. I'm thinking about getting some lowering springs - 30mm H&R seem to be recommended if you want to keep the original shocks, though they seem pricey. I've also heard you need to trim the bump stops, to stop the car riding on them? The real work starts in a week or two I hope! I've heard good reviews about 288 brakes, and managed to find almost everything I need on one of the Golf forums for about £40 - hopefully these will arrive in the next couple of weeks. I've picked up a spare set of speedlines with half decent tyres and put them on the car. The old tyres look pretty bad, and were wearing unevenly - probably because of the ball joint being so bad. Going to get everything aligned once the springs are swapped. I'm planning to refurb my Speedlines (myself) and get some decent rubber on them. Power upgrades will have to wait for now.. I foolishly forgot to take pictures of the clean car today. I've been driving around whenever it's not wet outside with the sunroof open... BECAUSE I CAN!!! Last edited by tony_ack; 13th February 2011 at 1:34 AM. Headed to Dubfreeze today, and I had the sunroof open - it wasn't really sunroof weather, but it was warm in the car, and I was driving down some nice B-roads. After a couple of times opening and closing, including once on the full closure, I opened it again, but when it had slid fully open, I heard the relay click twice instead of once... I tried to close it again, and nothing! The relay clicked if I tried to open it more, and if I tried the tilt functions, but nothing when trying to close it. Then it started to rain too.. When we got there, I got the panel off (easier said than done - I butchered the screws with the flat screwdriver from the Golf's VW toolkit, as the screwdriver was missing in mine), and started to wind the sunroof back with the crank. Moved freely and easily. I then tried the motor again and it worked fine the rest of the way! How odd.. not really sure what has caused this, though I have a suspicion that the end caps on the rails were missing from the replacement sunroof - maybe this was the problem? Needless to say I have the sunroof closed since then. I think it was a dodgy motor. The roof opened fine, but when I tried to close it, there was nothing, not even a click from the relay. It also wouldn't tilt up on the motor, but would tilt down absolutely fine, again no clicks from the relay in the motor at all when trying to tilt up. It must be an iffy connection somewhere in the motor. Luckily I have two spares, so I swapped it over and all is fine now... shame we don't have the weather to make use of it. Managed to get hold of a Schrick VGI last week... I've also got some 268 cams coming. I'm plucking up the courage to fit all this myself, and have been practising my soldering skills for the splice into the ECU. I am currently running the standard engine mount at the front, so it looks like I could do with a VT mount to avoid cutting away too much of the bonnet. When I think about it now, there is a lot of lurch when changing gear, so the engine mount would be a good upgrade anyway. I also need to think about where to mount the vac tank. I planned to wire in the Schrick control unit at home (no power at the lockup) and then head up to my lockup to install my fresh-sparkly-new VT front mount. The idea was to get the final preparations in place for the Schrick VGI to go on. Unfortunately the purchase of the cams fell through, so I'll have to look out for another set. My soldering skills aren't the best, but I had been practicing indoors, and had managed to do a few tidy splices. Outside, in limited space and good old northern rain and cold it was a different matter. The ECU was fiddly to get out for a start, and it took me ages to get a decent soldered join bewteen the loom wires and the Schrick control unit wires, as the wind kept cooling down the iron and the wires. Got there in the end - not as tidy as I'd have liked, but pretty solid. I started it up to make sure it was working - it struggled to start first time but the green light was on the control unit - hurrah! I revved to 4000 and the red light came on so all was good, but then the engine cut out. I started up again and it seemed to be running on 5 cylinders for a while, before the last one coughed into life. Odd... It's been fine since though. I went to the lockup to make a start on the 'easy' front engine mount. It didn't bode well when I snapped the stud on the first nut holding the plate on undert the bottom of the mount. The other two nuts were seized and starting to round, so I decided I had had enough of being nice, and broke out the Plusgas and Irwins Other two nuts were off a minute later. Next for the top bolt. I reached down for it, and caught a pipe slightly, but immediately heard the sound of coolant gushing out of the engine. At first I thought I'd knocked a hose off, then I saw that a flange had sheared off... bugger. I looked carefully, and realised it was the infamous crack pipe! So the Corrado is now off the road. The missus isn't pleased as she'll be taking me to work next week. 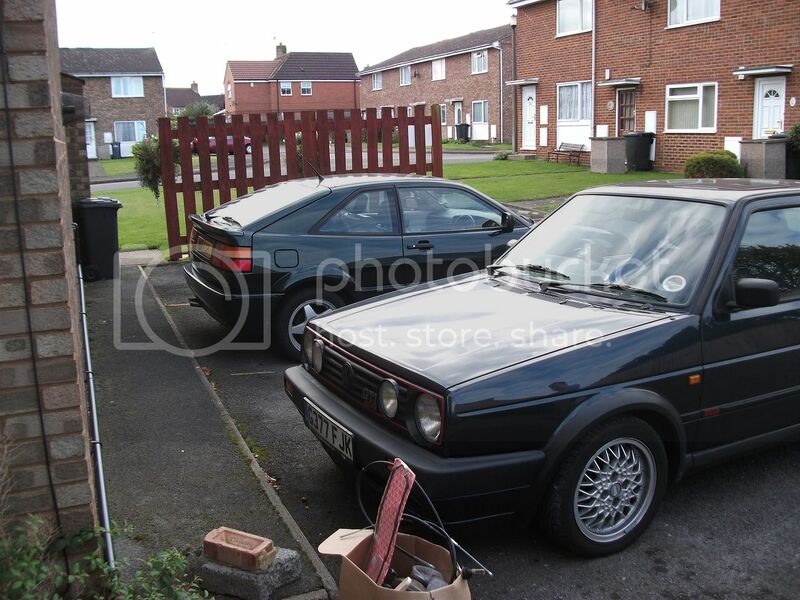 And it means the half-finished MK2 project is in the car park, while the Corrado takes the lockup space. I started the front end strip down this afternoon. I got my first good luck of the day when all 4 bumper bolts came out without a single one snapping, rounding, or breaking the captive nut. Up early this morning to try and get the Corrado back on the road this weekend. I went up for half an hour yesterday - I still couldn't work out how the bumper slid out - I think I just need to get the arch liners out of the way. I started on the slam panel bolts, but nothing is ever simple... both of the radiator bolts were stiff - one of them ended up coming off its thread, and is now just turning freely, and it looks like a support has broken on the other one, so that's not coming out either. I don't have time to get the bits from VW, so I'll have to get the bolts from B&Q, and order a new support next week to fit later. Hopefully, if all goes well today, I'll end up with a fully working Corrado, with a fully bled cooling system, new suspension fitted, and schrick VGI fitted. Best of luck today mate, watching the thread with interest.